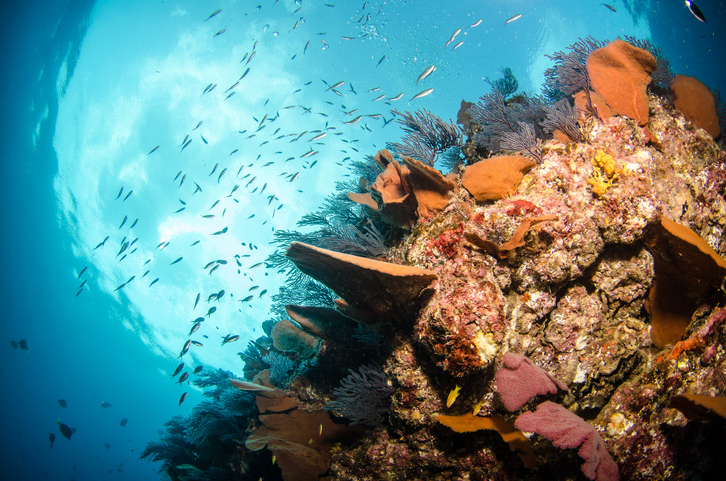 The Sea of Cortez is known as “The Aquarium of the World” for good reason! Cabo marine life is teeming with variety—you can even go diving with whale sharks! There is something about marine wildlife that just inspires awe. Whether it’s the dazzling colors of coral, the graceful movements of marine animals, or the stunning size of whales, the ocean delivers a majestic experience like none other. If you are like us and happen to be in love with the sea, then you won’t want to miss out on diving in Cabo San Lucas. The Sea of Cortez has been dubbed “The Aquarium of the World” for good reason. The waters surrounding Cabo San Lucas is teeming with a vast variety of marine life that you won’t find anywhere else in the world. Check out these fun experiences and just imagine the memories you can make while diving in Cabo San Lucas! Espiritu Santo Island is a place of pristine beauty with sunny beaches and crystal clear blue coves. It is also home to a fantastic snorkeling experience. The island is a locale brimming with exotic wildlife and is a natural sanctuary for sea lions. When snorkeling in the island’s azure waters, you’ll get an up-close view of multitudes of tropical fish, sea stars, as well as a variety of corals. If you’re lucky, you’ll be gifted with a memorable afternoon playing with sea lion cubs! Sea lions are peaceful, fun-loving creatures and are often quite friendly with humans. Swimming with these amazing animals will be a memory that’ll last a lifetime! At Cabo Pulmo National Park, in the crystal clear waters of Pulmo Bay lies another aquatic treasure: a living coral reef. This reef is one of three living coral reefs in North America and is rumored to be 20,000 years old! This jewel of Baja California is one of the most elaborate reefs in the world. The reef at Cabo Pulmo National Park is home to a plethora of marine wildlife. The waters surrounding the reef make for a crystal clear aquarium that allows a pristine view of the wildlife that makes their home here—including groupers, eels, and sea turtles! Of all the experiences to have in the Sea of Cortez, diving with whale sharks may be the most memorable. Whale sharks are gargantuan marine animals, with lengths easily exceeding 30 feet and weighing up to 20,000 pounds. Quite an impressive feat considering whale sharks only eat plankton. Whale sharks possess none of the aggressive temperaments of their shark brethren and the whale sharks near Cabo San Lucas tend to be particularly docile. There is a reason that these animals are known as “the gentle giants of the sea.” If swimming with whale sharks excites you, there is no better locale than Cabo San Lucas. However, these “gentle giants” are not the only colossal animals to swim with in Cabo. During certain times of the year, there are opportunities to go diving with humpback whales, another peaceful and majestic aquatic giant. There is a myriad of other Cabo marine life to be discovered in the Sea of Cortez. If you are an aquatic animal lover, Cabo San Lucas is the destination for you!